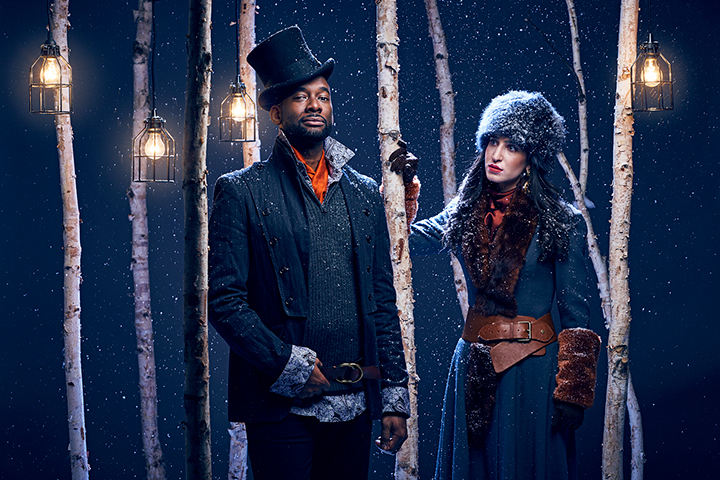 Based on Pushkin and Tchaikovsky’s nineteenth century poem and opera, respectively, with themes including love at first sight, unrequited love, and regret, one might be weary of another attempt to adapt old tales for our current times. However, you will be very surprised with what The Musical Stage Company has created with Onegin. A powerful cast, combined with a skillful indie-rock band, raise the roof on timeless themes, making the piece’s contemporary relevance truly shine. The vocals of each and every cast member shine at different moments throughout the production. Love-stricken Tatyana (Hailey Gillis) cannot possibly portray any clearer how her world has been transformed upon meeting Onegin (Daren A. Hebert), and once again when their relationship turns sour. Onegin, on the other hand, reaches his peak performance at the climax of the show when he tries to win back the attention of a now married Tatyana. The transformation from cocksure romantic to dejected individual who realizes he has lost his window of opportunity for great love is gripping, and it’s what makes this production contemporary. The classical elements of love stories such as class have not been lost, but here the company succeeds in highlighting the potential consequences of our non-committal tendencies and insatiable behaviors. Other characters include Tatyana’s sister Olga (Elena Juatco), her fiancé Vladimir (Josh Epstein), and their mother Madame Larin (Rebecca Auerbach). Playing an array of characters is Peter Fernandes who adds individual charm to each one. Juatco’s vocals are simply beautiful. While not insatiable to the level of our title character, in one scene Juatco dances the night away with Onegin, indifferent to the feelings of her fiancé. Auerbach is a fun compliment to the others as a mother who is boisterous at parties, yet comforting and protective of her daughters. Epstein, finally, manages to easily move from strong, confident, character ballads to edgier moments of reflection. In fact, the shift in music from more melodic to rock signals deeper moments of contemplation, as if they find themselves in these raw sounds. If anything, their voices are almost too crisp, too spot on for me to believe their struggles or their pain. Luckily their acting chops are not lacking. The orchestra upstage is, no doubt, talented and able to more than adequately support the performers and scenes unfolding (Barry Mirochnick, Erika Nielsen, Chris Tsujiuchi). However, there is a failed attempt at incorporating them into the show as existing in the realm of the afterlife. We are directly informed three quarters through that Vladimir, who has since been slain in a duel with Onegin and can be seen alongside the pianist, has joined the band as a member of the “Ungrateful Dead” – a likely wordplay on American band Grateful Dead. Other strange attempts at breaking the fourth wall were the performers speaking to and welcoming the audience members before the show. Yes it’s true, a good old country party will unfold – where Onegin is to meet Tatyana – but I needed to feel more included – invited even – throughout in order to necessitate this interactive element at the start. Where details are not lost are on the beautiful set (Denyse Karn). Karn’s successfully captures our full attention with large broken windows that loom over us, and scenery that fluidly takes us from inside the Larin residence to the outdoors, without messy complications. There are also many details in the props (Lokki Ma) and costumes (Alex Amini). Tissue paper domes help recreate the familiar cupolas of Russian churches, and transport us to St. Petersburg. Subtle elements such as fur cuffs and silk sashes allude to class and salute to old Russia, but don’t pull focus as we gaze beyond this seemingly simple story with a lot to say. All in all, definitely worth checking out. Onegin plays at Berkeley Street Theatre Downstairs until June 4, 2017. Jane the Plain: What’s In a Name?